Aesthetics – The Spyderco Resilience vs. Gerber E-Z Out? In this latest head to head review, I will be comparing and ranking the Spyderco Resilience against the Gerber E-Z Out on a range of different criteria. Before reading the full review, you should have a quick look at these knives on Amazon so you are a little more familiar with the features and price. View the Spyderco Resilience and the Gerber E-Z Out in a new window. The Spyderco Resilience folding knife definitely displays Spyderco's unusual way of thinking about folding knife design but also displays their commitment to incorporating high quality materials and excellent craftsmanship. It measures 9.375 inches open; 5.25 inches closed and the blade measures 4.25-inch blade. This particular plain edge model has the flat ground steel blade, G10 handle, and 4-way hourglass clip. The scales are held in place with screws and the body is construction with skeletonized steel liners. As with many of the Spyderco knives, it featured the large opening hole as well as choil jimping for a solid hold. When Gerber debuted their line of Gator folding knives in 1991, they were voted “Most Innovative Knife of the Year” at the Blade Show and the Gerber E-Z Out is a fine example of Gerber's commitment to quality. The E-Z Out measures 4.5 inches when closed, and weighs 2.6 ounces. It features a Fine Edge Clip pointed blade that is 3.5 inches in length. The scales are textured with a soft grip. Although both of these knives are very similar in appearance, I personally prefer the look of the Gerber E-Z Out over that of the Spyderco Resilience. In fact, the reason for my preference of the Gerber over the Spyderco is that personally, I have always found Spyderco knives to be a little weird looking. Therefore, I can wholeheartedly agree with the comment I mentioned on this page, that Sal Glesser must design his knives in the dark! But, what truly puts me off about Spyderco knives is the humpback spine and the large hole in the blade and, while I am aware that these features are there specifically to facilitate the opening of the knife with one hand, I find Gerber's blade design serves the same purpose but is more aesthetically pleasing to me. Concerning the blade design of these two knives, as I stated above, I find that I have a distinct preference for the blade design of the Gerber E-Z Out over that of the Spyderco Resilience. There are some features of each blade design that bear closer examination. For instance, due to the cut-outs on the blade of the Gerber E-Z Out, it necessarily features a relatively low Primary Bevel Line which necessitates the use of a Saber Grind but, which is offset by hollow grinding. The blade of the Spyderco Resilience features a Primary Bevel Line that reaches all of the way to the spine and thus it has a Flat Grind. Although a Flat Grind is normally much sharper than a Saber Grind due to the lower bevel angle of the cutting edge, in this case, I suspect that the two grinds are likely to be equal to each other because of the concave surface on the Saber Grind of the E-Z Out. One of my major peeves with various blade designs is the inclusion of a Choil and a Ricasso; both of which the Gerber E-Z Out features but neither of which is featured on the Spyderco Resilience. Now, for those of you who are not familiar with these terms, a Choil is a small cutout at the back of the cutting edge which enables the edge to be sharpened all of the way to the back. Ricasso is the space between the Plunge Line and the Bolster or the Quillions which serves several different purposes for a blade designer but serves to place a bit of space between the handle and the cutting edge for the user. In addition, the reason that I don't like either of these features is that both of them shorten the length of the cutting edge and especially in the case of a Ricasso, it places the back of the cutting edge farther from the user's hand which reduces the amount of leverage that the user can bring to bear when plunge cutting by lengthening the Moment Arm. Another aspect of blade design that affects its suitability for any given purpose is the shape of the tip and in this case, both knives feature a Drop Point blade shape which I find to be a very useful design because it places the tip of the blade closer to the blade's center line for greater control when performing precision cutting tasks with the tip. The Drop Point blade design is an excellent choice for a piercing for the same reason. But, all things considered, I still like the blade design of the Gerber E-Z Out better than I do that of the Spyderco Resilience and thus, I am inclined to rate the Gerber higher than the Spyderco. I have heard it said that if a knife manufacturer will not state what blade steel they use in their knives, then you should avoid purchasing that knife because it's probably a cheap steel with a relatively low Rockwell Hardness. One of the things that I have always found frustrating about Gerber knives is that they refuse to list the blade steel that they use to construct their knives. In fact, all that they do say about it is that it is a high-carbon stainless steel but, that encompasses a huge range of blade steels; some of which I would not accept if you gave the knife to me for free! However, with some extensive digging and researching I have uncovered that this Gerber E-Z Out knife uses 420HC which is an American blade steel consisting of 0.40% – 0.50% Carbon, 12% – 14% Chromium, 0.15% Molybdenum, 0.18% Vanadium, 0.80% Manganese but I couldn't get any accurate information on the Rockwell Hardness of the steel (using assumptions and a little bit of guesswork you'd generally expect this blade steel is normally hardened to 56-58 Rc). On the other hand, the Spyderco Resilience is made from 8Cr13MoV which is a Chinese blade steel that is roughly equivalent to Japanese AUS 8 and which contains 0.80% Carbon, 13% Chromium, 0.15% Molybdenum, 0.10% Vanadium, 0.40% Manganese, and 0.20% Nickel hardened to 57-59 Rockwell. Consequently, both blade steels are an excellent choice for everyday carry use because they are reasonably hard, reasonably tough, and highly corrosion resistant. However, 8Cr13MoV contains more Carbon than 420HC which makes the steel harder so that it will hold an edge better and yet, it contains less Vanadium which produces a fine grain structure that enables the steel to be honed to an extremely fine edge. They both contain the same amount of Molybdenum which forms hard, double-carbide, bonds with Chromium to make the steel both stronger and more abrasion resistant. 8Cr13MoV contains Nickel which 420HC does not which also serves to make the steel stronger and more corrosion resistant. Consequently, I find that in this category, I am compelled to rate both the Spyderco Resilience and the Gerber E-Z Out equally because the two steels are so close in performance that the user is not likely to notice the difference even though I personally have a strong preference for American blade steels over Chinese blade steels. The handle on the Gerber E-Z Out is made from GRN – Glass Reinforced Nylon (aka Zytel) whereas the handle on the Spyderco Resilience is made from G10 which is essentially the same thing except that G10 is available either with or without reinforcement. Because the box fails to state which type of G10 is used on their Resilience folding knife, I am left assuming that it is the non-reinforced type. The Gerber E-Z Out features a pair of “soft grip inserts” (aka Kraton rubber) on the inner side of the handle where the user's fingers wrap around it to provide extra comfort when using the knife for tough cutting jobs. In addition, the handle of the E-Z Out features a Lockback lever whereas the handle of the Resilience features a Walker Liner Lock lever which necessitates the inclusion of a thumb groove in the handle which I don't like because it exposes the edge of the thin leaf which locks the blade to the users finger. Although both handle materials are very tough and thus, they are an excellent choice for an everyday carry knife, in this category I feel like the Gerber E-Z Out is a better choice than the Spyderco Resilience. The locking mechanism featured on the Spyderco Resilience is a Michael Walker Liner Lock which is a quite popular type of locking mechanism for folding knives because, with this type of locking mechanism, the user can unlock the blade with one hand using their thumb whereas, with the Lockback locking mechanism found on the Gerber E-Z Out, the user is required to use both hands to release the blade. The reason for this is that when a knife with a Liner Lock is constructed, an extra leaf of metal is placed adjacent to the liner (a liner acts like the chassis of a vehicle to provide rigidity and strength) but, said leaf features a slight curve at the end which causes it to press against the side of the blade's tang so that when the blade is rotated into the open position, the curved end of the leaf springs into place behind the tang causing the blade to be locked in the open position. With a Lockback mechanism on the other hand, a heavy-duty lever is secured between the liners and is then pinned in the center so that it can pivot on the pin. Then, either a leaf spring or a coil spring is placed underneath the back of the lever to apply positive pressure to the lever. So, when the blade of a knife with a Lockback mechanism is opened, the lever bears against the edge of the blade's tang as it is rotated open where it then drops into a groove milled into the spine side of the tang which then locks the blade in the open position. 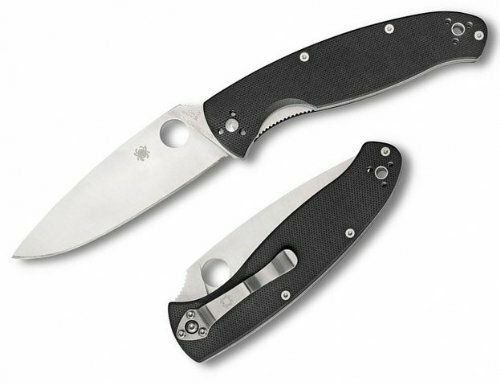 Consequently, even though I personally prefer Lockback mechanisms over Liner Lock mechanisms, in all honesty I feel compelled to rate the Spyderco Resilience over the Gerber E-Z Out. * Due to fluctuations in the market, and special discounts – you should check the prices of both knives on Amazon to see the most up to date price. View the Spyderco Resilience and the Gerber E-Z Out on Amazon to check the latest prices. Well now, with a retail cost of approximately $37.00 for the Gerber E-Z Out versus a retail cost of roughly $80 (note: seems to be around $41 on Amazon today) for the Spyderco Resilience, the Gerber E-Z Out would seem to be the obvious choice for the best value for the money. But, is that choice supported by their respective features? Well, in examining the respective handle materials I don't see any significant difference between the two except for the “Softgrip” inserts on the E-Z Out but, when comparing the blade steels, I feel like the 8Cr13MoV used on the Spyderco Resilience is a superior steel to the 420HC used on the Gerber E-Z Out. Even so, the differences are very minor. In addition, I see no significant difference in value between a Lockback mechanism and a Liner Lock mechanism and thus, in this category, I am inclined to choose the Gerber E-Z Out over the Spyderco Resilience as the best value for the money because I feel like the Spyderco Resilience is a bit overpriced at full retail, but offers decent value when discounted. Personally, I would be pleased to carry either of these knives as my everyday carry knife since both of them are well designed, well made, knives from companies with long standing reputations for producing high quality products. But, actually choosing between them is tough choice because on the one hand, I like the appearance and design of the Gerber E-Z Out over that of the Spyderco Resilience but, at the same time, I prefer the 8Cr13MoV blade steel over the 420HC blade steel because I feel like the 8Cr13MoV is marginally better steel. However, as I mentioned previously, I have never found Spyderco knives to be my cup of tea and thus, in this category, I would have to choose the Gerber E-Z Out over the Spyderco Resilience. After adding up the scores, I am actually quite surprised to find that in my opinion, the Gerber E-Z Out rates so much higher than the Spyderco Resilience! However, both knives are high quality products from reputable companies and thus, I would not feel hesitant about purchasing either one of them. Clear, concise, complete review. Add that to the idea that I have these same personal peaves about Spyderco and I think I would find your reviews informative and helpful all the time. Thank you and keep up the good work.